Yah in week 3 we can finally see some progress. 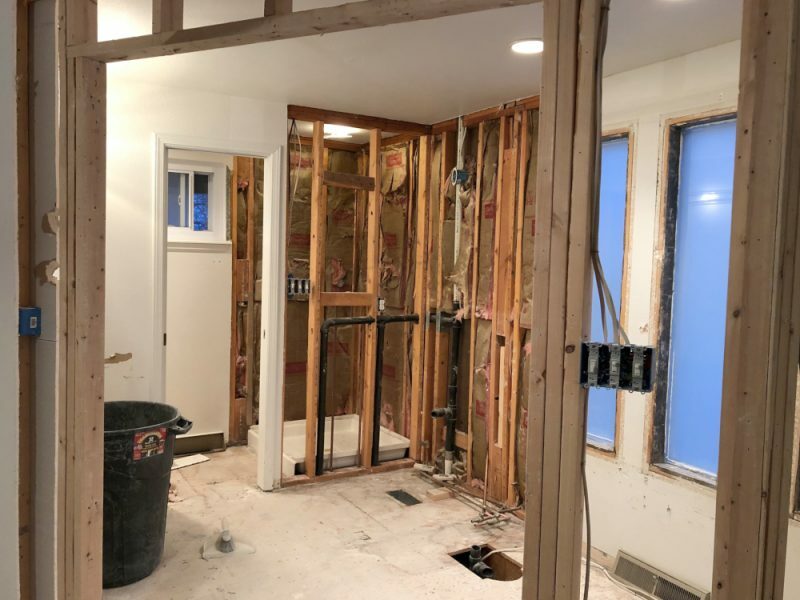 Not that plans and clean up in week 2 wasn’t progress, but with finally something up on the wall I am feeling more accomplished. In case you forgot here is where this room looked like a few weeks ago. 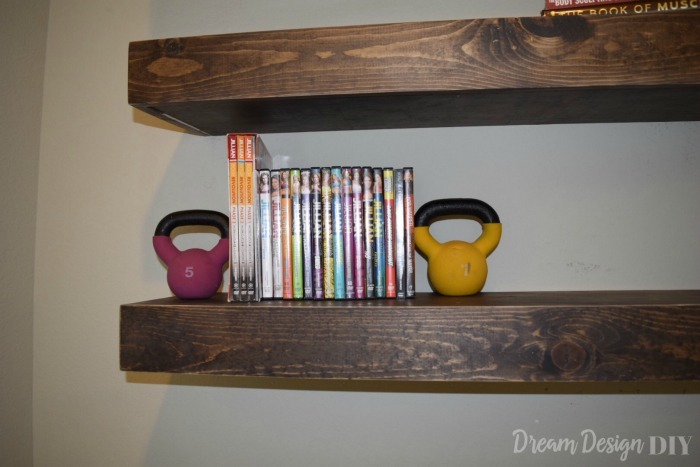 For week 3 I made DIY removable floating shelves…wow that is a mouthful. Before deciding how I wanted the shelves I grabbed some craft paper and played around with placement, length, and width. I knew I wanted to put floating shelves on the wall to help with getting various items off the floor and to add some decor to the room. I also wanted hefty/heavy looking shelves. One last thing that I wanted was to be able to make these shelves removable. Since we are renting I wanted to be able to take these shelves with me when we buy a house someday. With how I made these shelves I was able to accomplish all that I wanted. I love the way the shelves turned out. See how they are removable? All I need to do is remove the outer shell and unscrew the screws from the wood brackets and they are ready for the next house. Making them perfect for renting. 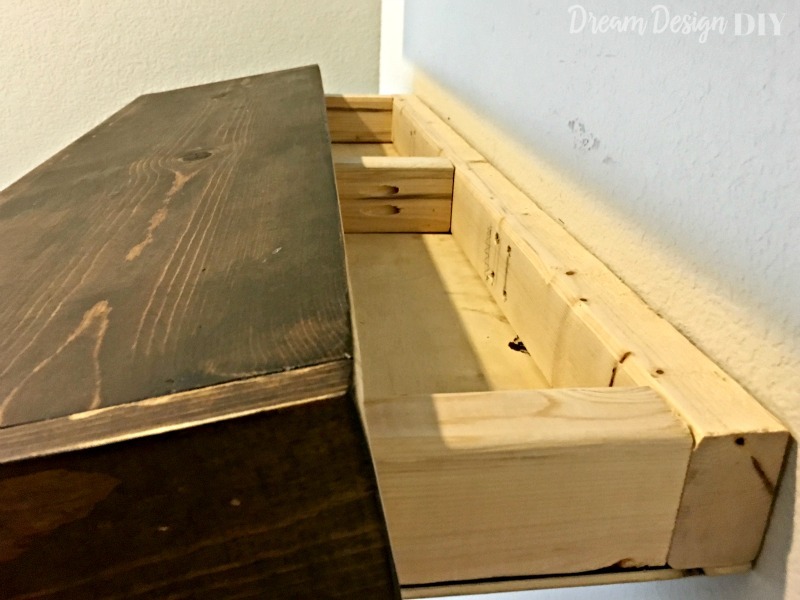 Also they make a great hiding space for items…like maybe some candy bars or donuts for after my workouts ;-). Now the only things these babies are missing is some accessory/decoration love, which will happen during week 6 for the final reveal. Make sure to check back for the full tutorial on the floating shelves once the challenge is completed. In the mean time thank you for stopping by. I hope you are enjoying the ORC. 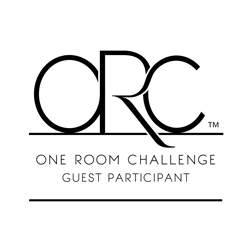 I have really enjoyed watching the other amazing participants’ rooms come together. Click here to check out their progress. Thanks Teresa for checking them out! 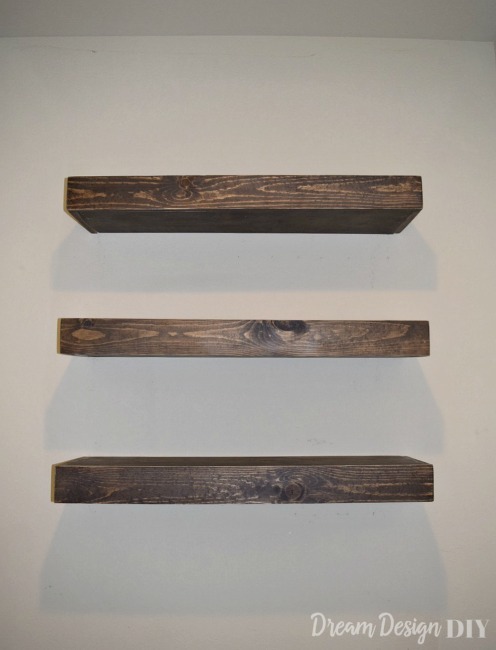 I love your floating shelves they look awesome! Thanks Mindi for stopping by! Thanks Sabrina! 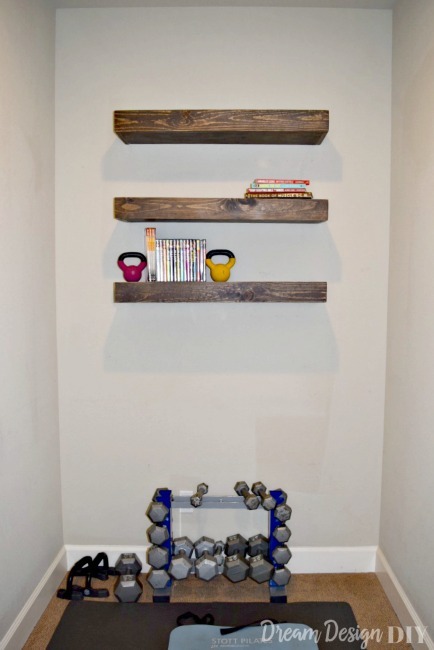 I am super excited about the workout room and the shelves. Those look great! 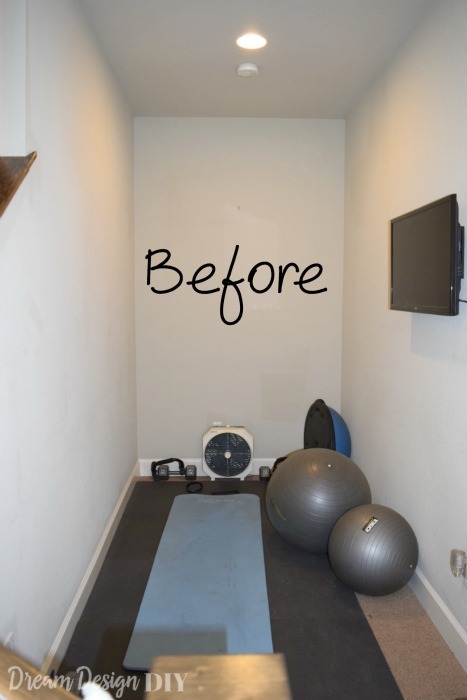 You are so lucky to have a space to dedicate to workouts! 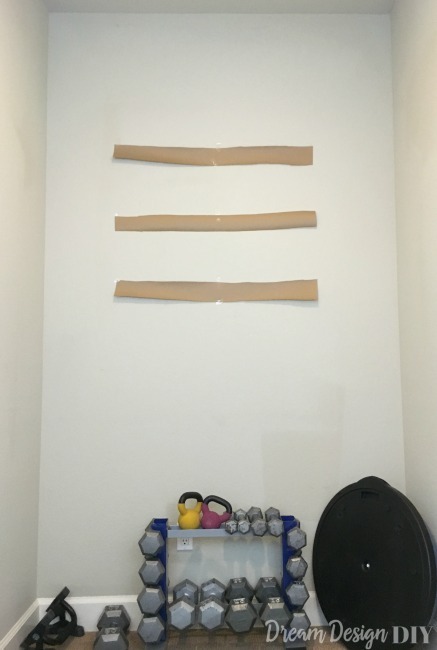 Danielle recently posted…One Room Challenge Week 3! Floors are down! I think the space is perfect too. Just enough room to move around. LOL! 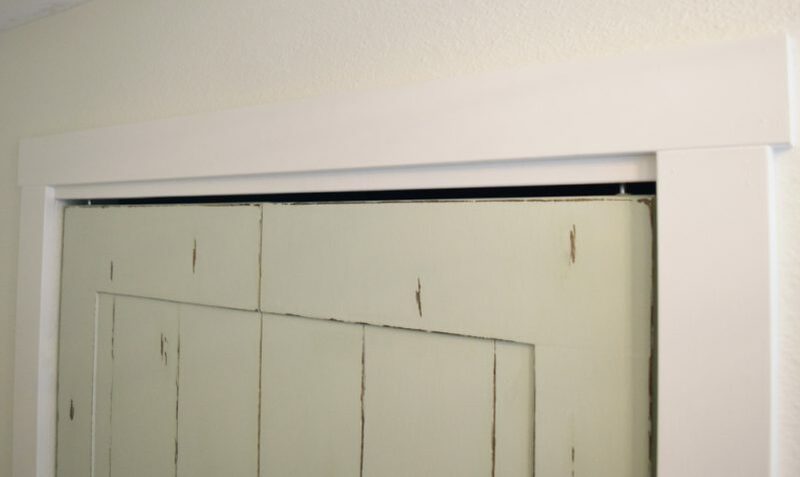 Great hiding space for those candy bars. =) Love the progress. Ha ha yes unfortunately I could probably hide lots of candy bars in these shelves. Thanks Tee for stopping by! Hi Debi so glad you like them! The floating shelves look SO good!!! And let me tell you right now, if I hid donuts and candy bars in there, I’d probably just sit on the floor eating while watching a workout video. Does that count as a work out? Raise my arm, insert food into my mouth? No? I am obviously not on my way to a 6 pack anytime soon. Great job this week! Can’t wait to see the tutorial for those shelves! Those shelves are awesome! I love the dark wood stain, this is going to be a great space when finished. Its amazing what something like a few shelves adds to a space. I can’t stop staring at them when I go in my basement. Love Love Love the floating shelves!!! Great job on those. It’s coming along yay!! Glad you love the shelves. Yes slowly but surely coming along. Most people are loving the hidden candy bar idea…maybe I am encouraging the wrong motives here..haha! I love the shelves. The room looks great so far. Thanks so much for checking them out! The shelves look great! 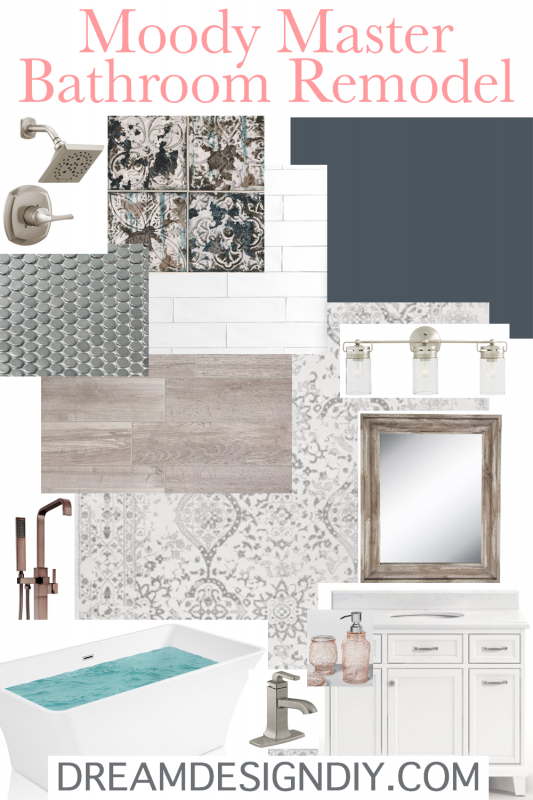 Excited to see the decorative elements in the room and love that you’re doing a workout area. It’s fun to see something different! I love your floating shelves! 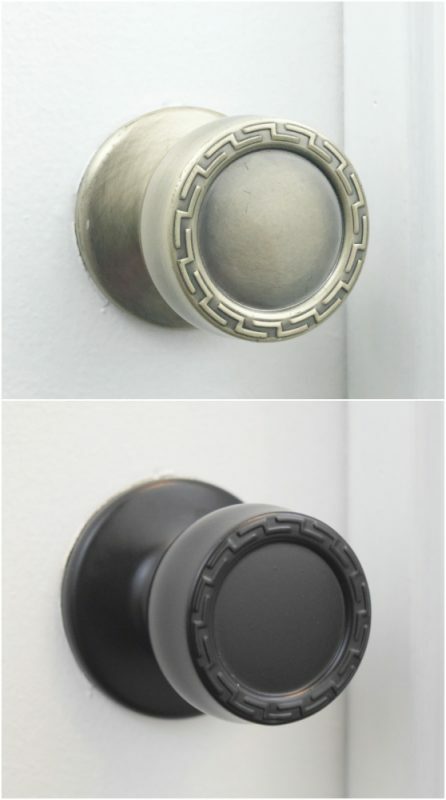 I’ve been wanting to put these somewhere in my home so badly!